Hey all - I've been lurking for a while, but I think this will serve as a good first post. I certainly won't be bringing anything groundbreaking to the forums, but I'm proud of my little achievement. 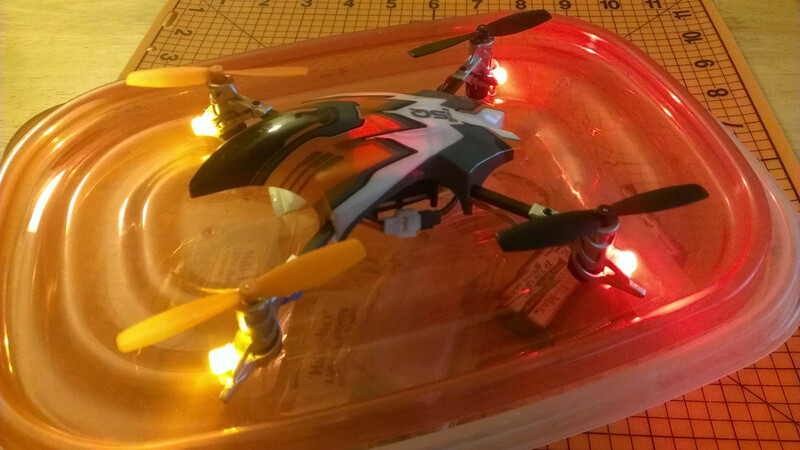 I am just getting back into R/C hobbies. The last time I was involved, carrying around clothespins with transmitter frequencies was mandatory. 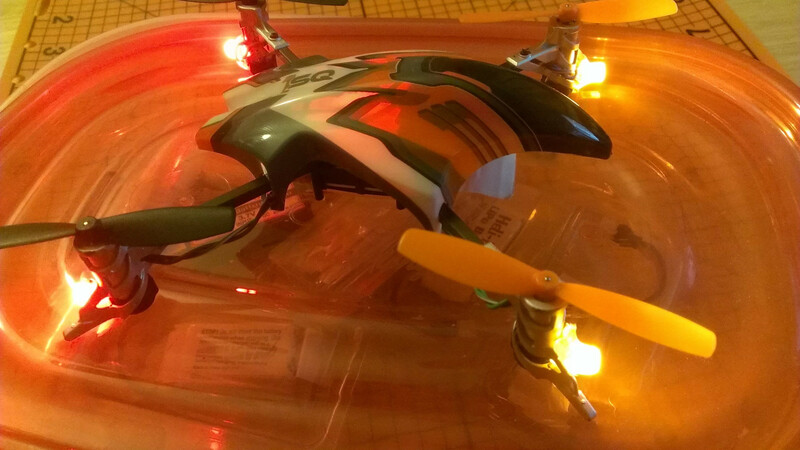 I am fascinated by multirotors, so I picked up an Estes ProtoX and a Heli-Max 1SQ. One thing I really love about the Estes is that it has LEDs which provide some help with orientation. The 1SQ, however, does not. Since I have primarily been flying indoors, and often at work (late shift in a darkened room), I wanted to get a similar system set up on the 1SQ. I decided to do it myself instead of buying the pre-made set that flashes, or replacing the motors with the V-Cam LED booms. It was a good project for a couple of days and I'm pleased with the result! 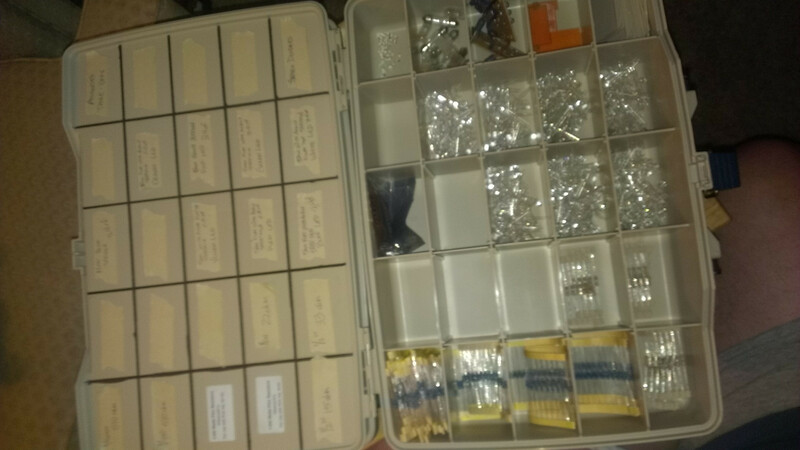 Disclaimer: Please forgive any ugly soldering and wiring - it's been a few years and this is a much smaller scale than I had proper tools for, but I made it work. I used 5mm Superbright Wide Angle LEDs that I purchased back in 2007 or 2008 when I was doing car audio competitions. I was going to use loose SMDs but the scale was just too small to comfortably work with. 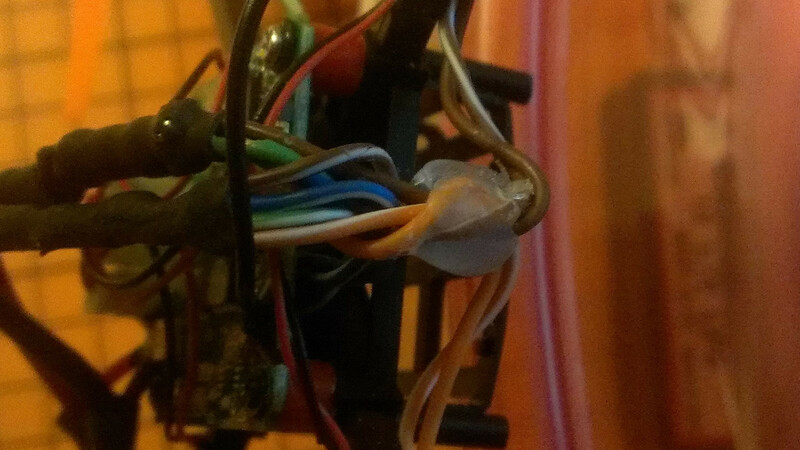 I tried to use some scrap headphone wire, but there was nylon fiber mixed in with the copper and it ended up being too fragile. 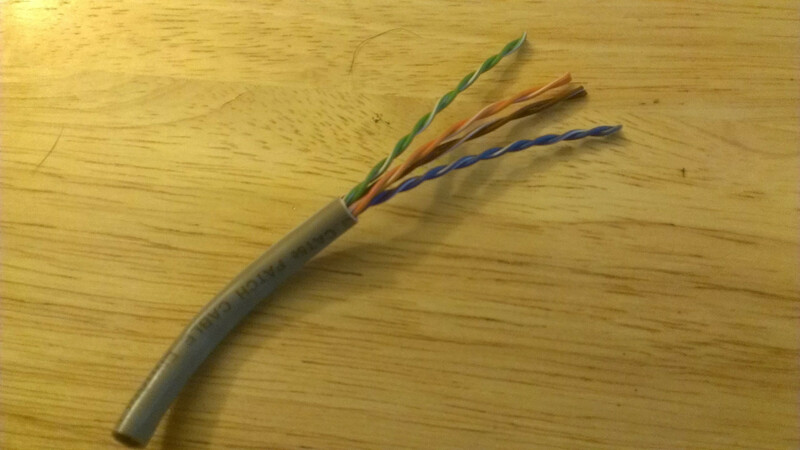 Plan B: Split apart a scrap Cat5 network cable - it has 4 twisted pairs of wires! This was a great lesson - these would work great for running along any R/C vehicle that needs a long lead. I built a test bed with the twisted pairs and they worked well, but the forward voltage of the red LEDs for the rear made using the blues not work well. I am running the set in parallel with only one resistor on the positive input. 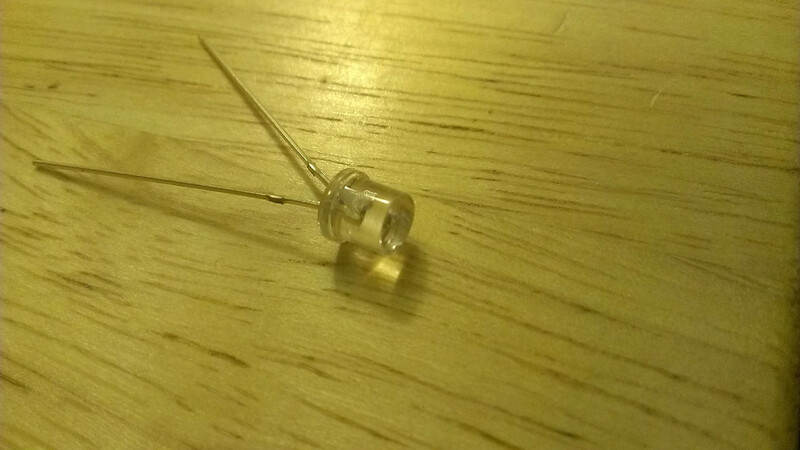 I ended up using in a 1/2 watt 15ohm resistor on the production version. I spliced this into the main battery lead going to the control board, leaving enough wire slack so the lead can still be moved around. 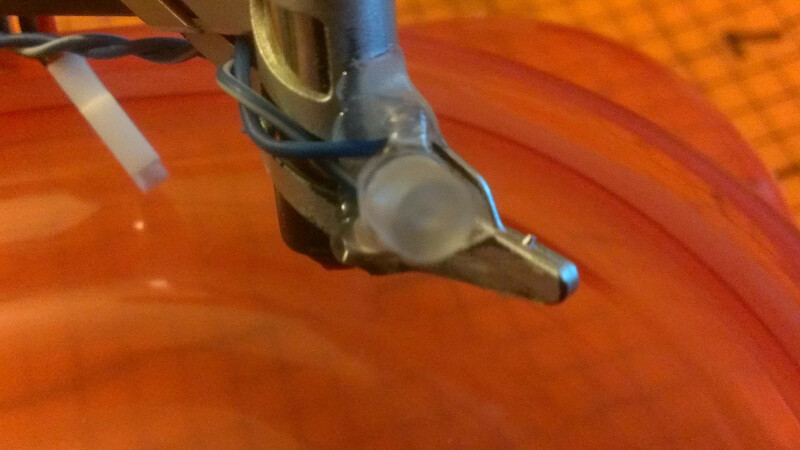 A little heat shrink tubing keeps things spark-free. I ran all twisted pairs in parallel, with common positive and negative leads. 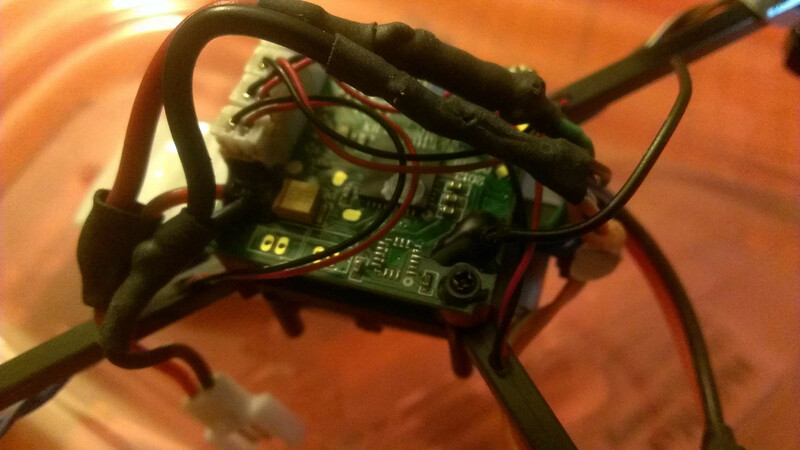 I secured the twisted pair bundle in place on top of the battery stop tab with a bit of hot glue. 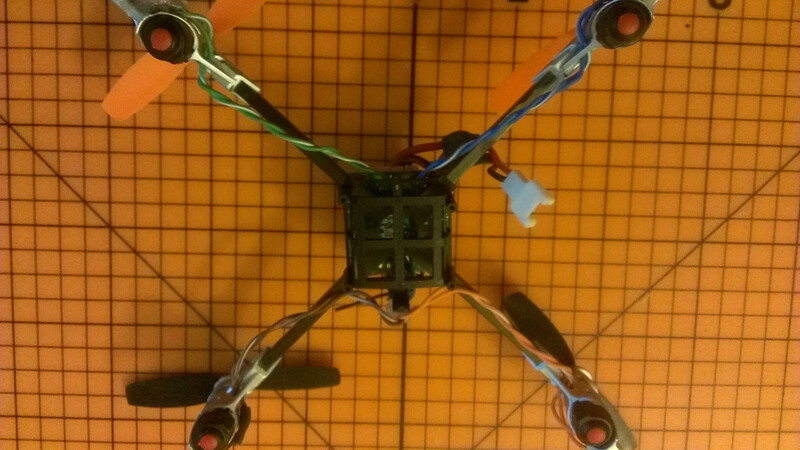 I routed the wires for the front boom in the space between the control board and the battery tray, and temporarily zip tied them in place before making final cuts on lead length and soldering in the LEDs. I think it looks pretty clean from below! The leads are ran through a hole in the boom to keep them tidy. I used some sandpaper to scratch up the LEDs for a 'frosted' look and rounded out the tops a bit before soldering them in place. I also scuffed up the pockets in the booms with sandpaper before attaching the completed LED to the boom with hot glue. The completed set of LEDs. I used red in the back and yellow in the front, since the forward voltages matched up. I think I made something pretty cool, and it didn't cost me anything but time. Thanks for looking! Hope you liked it! That is pretty cool. I like the 'frosted' look on the leds.